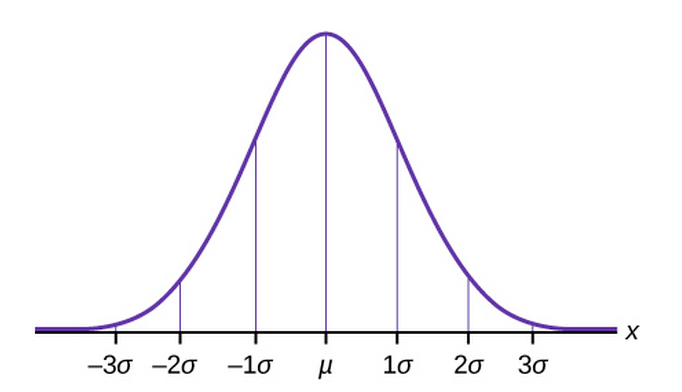 The mean for the standard normal distribution is zero, and the standard deviation is one. The transformation produces the distribution Z ~ N(0, 1). The value x comes from a normal distribution with mean μ and standard deviation σ. The following two videos give a description of what it means to have a data set that is “normally” distributed. Summarizing, when z is positive, x is above or to the right of μ and when zis negative, x is to the left of or below μ. Or, when z is positive, x is greater than μ, and when z is negative x is less than μ. What is the z-score of x, when x = 1 andX ~ N(12,3)? Suppose a person lost ten pounds in a month. The z-score when x = 10 pounds is z = 2.5 (verify). This z-score tells you thatx = 10 is ________ standard deviations to the ________ (right or left) of the mean _____ (What is the mean?). Suppose a person gained three pounds (a negative weight loss). Then z = __________. This z-score tells you that x = –3 is ________ standard deviations to the __________ (right or left) of the mean. This z-score tells you that x = 10 is 2.5 standard deviations to the right of the mean five. z= –4. This z-score tells you that x = –3 is 4 standard deviations to the left of the mean. Suppose the random variables X and Y have the following normal distributions: X ~ N(5, 6) and Y ~ N(2, 1). If x = 17, then z = 2. (This was previously shown.) If y = 4, what is z? . Jerome averages 16 points a game with a standard deviation of four points. X ~N(16,4). Suppose Jerome scores ten points in a game. The z–score when x = 10 is –1.5. This score tells you that x = 10 is _____ standard deviations to the ______(right or left) of the mean______(What is the mean?). About 99.7% of the x values lie between –3σ and +3σ of the mean µ(within three standard deviations of the mean). Notice that almost all thex values lie within three standard deviations of the mean. Use the information in Example 3 to answer the following questions. z<= , This z-score tells you that x = 176 cm is 0.96 standard deviations to the right of the mean 170 cm. The z-score for y = 162.85 is z = –1.5.Both x = 160.58 and y = 162.85 deviate the same number of standard deviations from their respective means and in the same direction. In 2012, 1,664,479 students took the SAT exam. The distribution of scores in the verbal section of the SAT had a meanµ = 496 and a standard deviation σ = 114. Let X = a SAT exam verbal section score in 2012. Then X ~ N(496, 114). About 95% of the x values lie between –2σ = (–2)(6) = –12 and 2σ = (2)(6) = 12. The values 50 – 12 = 38 and 50 + 12 = 62 are within two standard deviations of the mean 50. The z-scores are –2 and +2 for 38 and 62,respectively. About 99.7% of the y values lie between what two .7% of the values lie between 153.34 and 191.38. The z-scores are –3 and 3. About 68% of the y values lie between what two values? These values are ________________. Thez-scores are ________________, respectively. .7% of the values lie between 153.34 and 191.38. The z-scores are –3 and 3. About 95% of the y values lie between what two values? These values are ________________. Thez-scores are ________________, respectively. About 99.7% of the y values lie between what two values? These values are ________________. Thez-scores are ________________, respectively. About 68% of the values lie between the values 41 and 63. Thez-scores are –1 and 1, respectively. About 95% of the values lie between the values 30 and 74. Thez-scores are –2 and 2, respectively. About 99.7% of the values lie between the values 19 and 85. Thez-scores are –3 and 3, respectively. A z-score is a standardized value. Its distribution is the standard normal, Z ~N(0, 1). The mean of the z-scores is zero and the standard deviation is one. If zis the z-score for a value x from the normal distribution N(µ, σ) then z tells you how many standard deviations x is above (greater than) or below (less than) µ.